Never ever say never… you still have time. MAKE THAT CHANGE in Your LIFE! anywhere, anytime and in any position on anything. It was always the family joke, “Dad’s sleeping again.” The old: who, what, when, where, why. Who?… was watching, I didn’t care. What?… was the reason… I was fat. When?… anytime and just because. Where?… anywhere and in any position. Why?… why not, it was the thing to do. In the end, I was just sick and tired of always sleeping. So in 2009, when I was picked up by a police officer for sleeping at a stop sign at 11:30pm with no alcohol involved and I was hooked up to a Breathalyzer machine (and passed)… The light bulb went on! I need to lose some weight so that I stop sleeping, eating and working. It’s Never. Ever. Too Late in LIFE to GET FIT. NEVER! Make that CHANGE! After being tested for sleep apnea in early 2010 and being told I didn’t have sleep apnea, but that I should lose probably lose some weight… PROBABLY? I weighed 310#! At the same time I made this decision, I also decided that my crooked teeth needed some attention after 50 years, so I decided to get braces. YES, braces at the age of 50! February 2010 I was fitted for braces that were going to be one for 19 months. I’m also hard headed so I didn’t want any broken brackets and followed the DO NOT EAT food. So hand-in-hand this CHANGE in my life was gonna happen. Making a long story short… I lost 135# in 10 months and never broke a bracket in 19 months. I was not on a D.I.E.T., because I’m wasn’t quite ready for the first 3 letters of that word. It was a lifestyle food change for me. The book my wife bought written by Joy Bauer “Your Inner Skinny”, not only saved my life but made me a believer that I could do anything in my life. LIFE after 50 years old! I have straight teeth and a beautiful smile. 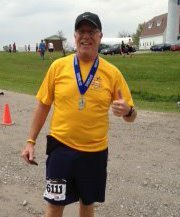 I became a runner… 5K’s, 10K’s, 15K’s, 1/2 Marathons, and even a MARATHONER (Chicago 2013). I am in a book published in 2012 (my weight lose story), The Joy Fit Club Cookbook, Diet Plan & Inspiration. I walked 2 of my daughters down the aisle to get married, and the 3rd one on 8/15/15. I am a grandfather to a sweet baby boy (May 2015). Our “LITTLE MAN”. I will be a grandfather times 2 in September 2015. Our ‘LITTLE LILY”, a girl. I have been married 36 years to my high school sweetheart. I have skydived and jump out of airplanes for fun. I have been the Fenway Park to see my Boston Red Sox during the 2013 World Series post-season. I have ran up the stairs of the John Hancock Building in Chicago many times. I could go on and on, but my point is… If you ever think doing the things in life is TOO LATE, then think again and make that CHANGE. I CHANGED MY LIFE… CHANGED MY ENERGY… CHANGED MY BUSINESS… Just because I decided to lose 100# in 2010. All of the things above have been done after I decided to make a CHANGE. Get Fit For Life… Just not an expert!